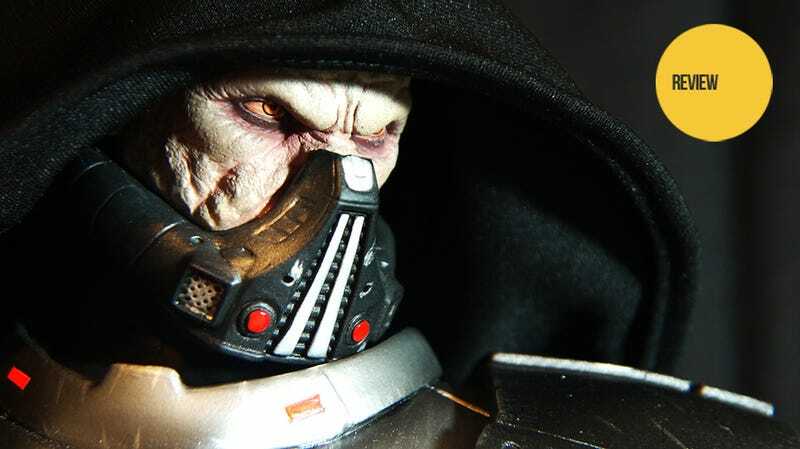 Star Wars: The Old Republic couldn't have Darth Vader, so it got Darth Malgus. Now that I've got him standing 20 inches high on my desk in the form of Sideshow Collectibles' Darth Malgus Premium Format Figure, he might be my favorite Sith Lord ever. I mean, Darth Vader will always be an iconic figure in film history, what with his Steam Controller-looking mask and his James Earl Jones voice. He was the biggest villain of my childhood, the evil hiding under the bed, inside the closet, or within the hollow of a dead tree. 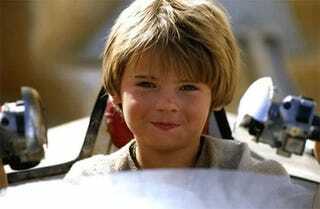 A cute little boy in a pod racer. An awkward teen comparing his girlfriend to sand. Then Darth Malgus arrived. Making his first appearance in the first cinematic trailer for Star Wars: The Old Republic at E3 2009. I was in the audience when it was show. I was so excited I peed a little. The Vader influence was immediately clear — the ribbed armor, the lighted respirator, the mask — but those horrible orange eyes peeking out from under his black hood? That's all Darth "Crashing an entire ship filled with bad guys into Coruscant and just standing there" Malgus. How many f***s does that face look like it has left to give? Hint: a true Sith Warrior needs no f***s.
What makes Malgus so great is the fact that he is a warrior, through and through. Sith of The Old Republic MMO-era Star Wars love to get involved in political machinations and manipulation. 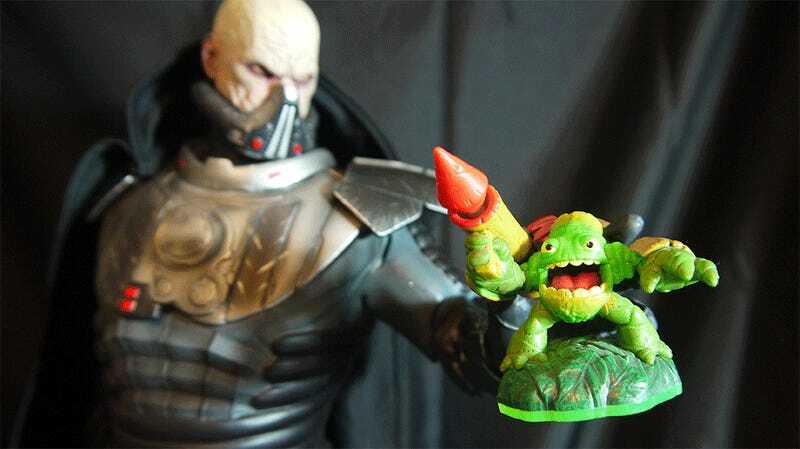 Malgus is having none of that. When he found out that amazing entrance he made on Coruscant was nothing more than a ploy to manipulate a peace treaty on Alderaan, he killed his lover to secure the power needed to try and wipe the stink of politics from the Empire. Or something like that. He's freaking amazing. Just look at Sideshow's $375 version of him. See? He's all blurry, and the details are a little lost against the black-out curtain I purchased from Walmart specifically for the purpose of displaying him against it. The glow isn't helping matters either. Oh yes. You could even say he glows. Darth Malgus here is wired for glow. An AC adapter plugs into his base. His foot, attaching to the base, has an circular power connector in it, as does his neck and the blade of his lightsaber. It's like plugging in Christmas lights, only without the smell of Pine (that's Star Trek). Sadly, my photos are doing a horrible job of showing off the little details that make mine Malgus. The metal plating on his boots, worn and scratched from countless battles. The fine cloth of his cloak, with its handy wire-rimmed hood, perfect for posing. His arm thing, which he uses to make it look like his arm is incredibly important. And there's that face again. Easily my second-favorite feature of the figure/statue. The hood falls just right, the veins, wrinkles and other discolorations are just perfect. What's my first-favorite feature? His friendly hand. See? Maybe he really just wants to be our friend, after all. Aw, he has a spoon. Want a closer look at my favorite Sith Lord? It just so happens I prepared a video for the occasion. Darth Malgus is a magnificent figure in the extended history of the Star Wars universe, introducing a new generation of fans to the franchise and showing the MMO crowd that being evil has its rewards. He deserves a spectacular figure. Statue. Whatever. 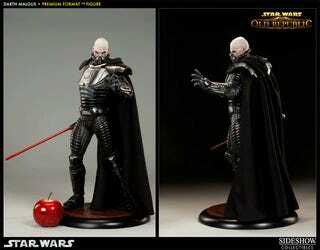 He deserves it, and Sideshow's Darth Malgus Premium Format Figure is 20 inches of just rewards. It captures his power, his determination, and his signature glow, while leaving his hand open to interpretation. You know, for the kids. Sideshow Collectibles' Premium Format Darth Malgus is limited to 1,000 pieces, and available for preorder/purchase here.